Lonely Diana Fleming knows handsome knights don't really exist. But can a festive kiss from the man she loves reawaken her frozen heart? Normally I would normally do a long review, but because there are three books, I thought I would just write a little on each book. This is a new author to me. I was a little disappointed with the book. 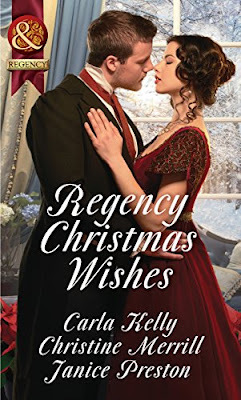 For me there was nothing to say it was Christmas and it didn't feel I was reading a regency book. The book was mainly set in America and I think that's why I didn't get the regency feel. If you've read this author before then you will like this short story. This is another new author for me. For this book had the right balance of romance and the Christmas theme ran through the book. I loved the chemistry between the hero and heroine. The heroine's sisters were a joy to read and I hope at some point get their own story. If you are a fan of this author then you are going to like this book. As you know I love the hero's in Janice's books and that includes this one. This book was a joy to read, I loved the hero and I so wanted to give the heroine a big cuddle. The hero's brothers and sisters were adorable and I hope they get their own story. The heroine's mother is very demanding and early in the book I did feel some sympathy for her, but as I continued to read, I really wanted to tell her to leave her poor daughter alone. I loved this book from start to finish and out of all the books this one is my favourite. I will give this book 4/5 stars, that's because for me the first book didn't have the Christmas feel to it.